The CAN fiber optic converter distance and speed of optical fiber transmission aren’t related. Serial-interface fiber transmission resolves the contradiction of copper transmission’s long-distance and high-speed communications because of it’s advantages such as high reliability, security and confidentiality and so on. The use of fiber as communication transmission medium completely solves the problems such as electromagnetic interference, ground loop interference and lightning damage. It has been used more and more in industrial automation, distributed data acquisition, intelligent transportation, electricity, water, banking and many other areas and become the preferred option for communications transmission. FIB-CAN-S is an industrial grade CAN to fiber converter of Fourstar. It achieves CAN signal’s transparent transmission on fiber, without changing the original communication protocols and software, plug and play, and directly replace copper conductor transmission. This product is based on binary diqit transparent transmission of data, thus more suitable for the communication protocol whose physical interface is CAN. Surge capacity: Ipp = 100A (10/700us, 4KV),standards: ITU-TK20/21, VDE 0433. Terminal resistance switch: OFF ---- no termination resistor, R ---- with 120 Ohm terminal resistance. 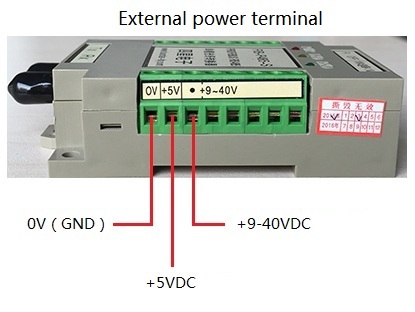 External power: the right terminal is a two-group external power terminal, one is 9 ~ 40 VDC wide-voltage, and the other is 5 VDC fixed voltage. Any one of them is ok. You needn’t to worry about the power fluctuations. Isolating CAN signal with external power within the product through DC / DC isolation module. Thus the power supply can be taken from any power terminals of equipment or powers of different equipments, to avoid the ground loop interference caused by the 共地 of external power and CAN signal， and generate the safety of equipment. When fiber converter is in the CAN bus terminal, terminal resistance switch should be transferred to R location. In other locations of the bus, the terminal resistance switch should be transferred to OFF position. Use fiber to link the two fiber converters. Connect Tx to the other one's Rx, Rx to the other one’s Tx. The bend radius when laying the fiber can’t be less than the allowed one, or the core is easily broken. use the configured rubber to cover it when it isn’t connected.